CAMP HUMPHREYS, South Korea – In a season opener between teams led by newcomers, Joseph Young scored 24 points to lead No. 19 Oregon to an 82-75 victory over Georgetown in the 2013 Armed Forces Classic here. The Ducks and Hoyas tipped off Nov. 9 at 10:16 a.m., on a Saturday morning in the Humphreys Community Fitness Center. For college basketball fans across America, the game was one of many season openers on Friday night. Only one, however, was played before 2,100 U.S. troops and their family members, along with a worldwide television audience on ESPN. Young, a junior guard who transferred from Houston is a son of Michael Young, who played for the high-flying “Phi Slama Jama” teams of the early 1980’s. He grabbed five rebounds and was perfect on 12 free throws in his first game as a Duck. Joshua Smith, a 6-foot-10, 350-pound junior center who transferred from UCLA, led Georgetown (0-1) with 25 points on 10-of-13 shooting and 5 of 9 free throws before fouling out of his first game as a Hoya with 9 seconds remaining. Jason Calliste made all 11 of his free throws and scored 16 points for Oregon (1-0). Mike Moser added 15 points, seven rebounds and a career-high six steals, the most by an Oregon player in 15 seasons. Darius Wright was the last Duck to post six steals in a game against USC on Jan. 7, 1999. Damyean Dotson grabbed eight rebounds and Johnathan Loyd had seven assists for Oregon. Loyd recorded his 304th career assist for a spot on the Ducks’ top 10 list. The Hoyas shot 1 of 15 from 3-point range, failed to find much offensive continuity, and were outrebounded, 40-32. Oregon took an 18-7 lead via a 12-2 run, capped by two free throws by Calliste with 12:27 remaining in the first half. Calliste also converted a three-point play that gave the Ducks a 30-23 lead with 5:25 remaining in the period. Oregon led, 37-34, at halftime. Georgetown took its first lead since 2-0 on a steal by Markel Starks and Smith’s feed to Jabril Trawick for a layup and a 40-39 lead with 18:06 left. D’Vauntes Smith-Rivera’s jumper put Georgetown ahead, 42-39. Loyd responded with a 3-pointer, Young followed with a layup, and the Ducks led the rest of the way. Starks finished with 16 points and four assists for Georgetown. Trawick added 11 points and three rebounds. Before departing, Moser saluted the troops who welcomed the Ducks to Camp Humphreys, their most distant regular-season game site in school history. Played on Veterans Day weekend, the game featured a military theme throughout. 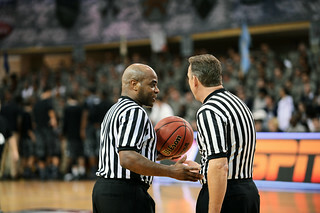 Rather than players’ last names, Army values, such as “Courage,” “Integrity” and “Respect,” adorned the back of Georgetown’s camouflage-patterned jerseys. The backs of the Ducks’ camouflage-patterned jerseys displayed: “USA.” Members of both coaching staffs wore military-style cargo pants and combat boots. Georgetown players Nate Lubick and Starks also were appreciative. Folks at Camp Humphreys thought likewise. Oregon played without sophomores Dominic Artis and Ben Carter, who were suspended nine games for violating NCAA rules by selling school-issued athletic apparel. If only they knew what they missed.